This is basically an update / extension of the original article from here with a lot more models and information on some of the affordable (but unfortunately less and less available) high-end quartz wristwatches - and this time with some more numbers and details on the actual accuracy! (and this might also be a good place to mention that high-end quartz is not about price or brand name, but instead about the real technical challenge of having a very high guaranteed accuracy over a decent range of temperatures in a nice and solid wristwatch) - see also this thread in the HEQ forum at WUS. 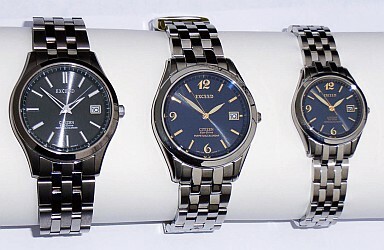 There will still be plenty of references to the original EBJ74-1742 (Citizen Exceed E510 titanium) and SBQJ015 (Seiko Spirit 8F56 titanium), but my 'affordable HEQ' mini-collection was now extended and also contains a second Exceed E510 in steel (EBJ74-1611) together with the matching-pair E410 (EBG75-1611), one 8F33 in titanium (US-market SMD013) and one 8F33 in steel (SBQL001 Japan Domestic Market = JDM), one 8F35 ISO diver in steel (Seiko Prospex SBCM023, also from JDM) and finally one Swiss HEQ from Longines = Conquest VHP Perpetual with caliber L.546.2 (which is actually based on ETA 252.611 - but since ETA HEQ calibers seem to have all started from the very early Longines 276 it can be considered that Longines could claim such codes as part of their heritage). 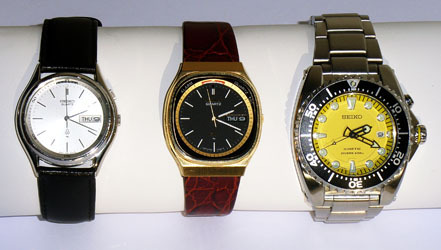 Two 'older HEQ' models will also be referenced in regard to actual timekeeping performance - one true-vintage (30+ years) HEQ King Quartz caliber 9923 (TwinQuartz) and a slightly newer (than the TwinQuartz, but still from the previous millennium) Seiko Spirit with caliber 5E31 - together with references to three non-HEQ quartz models (two vintage 7223 and one recent 5M62 ISO diver) that will provide some form of 'generic quartz performance baseline' - but each one with a 'special twist'. I also have nicknames for most of the above - 'Shinyella', then the paired 'Indigo Sparkles', 'Travelzilla', 'The Klingon', 'Black Ninja', 'Creamy Beauty', then on the second row 'Conquest', 'Tiny', 'Old King', 'White Bellmaquartz', 'Gold/Black Bellmaquartz' and finally 'Yellow Kinetzilla' (also known on the web as BFK = Big Freaking Kinetic). Some NOS models sometimes surface - E510 and E410 models now usually around 750 US$ and I have seen once some very few NOS SBQJ015 being sold very close to that. About one month after I got my (pre-owned) Longines I have also seen two NOS models (with a white dial) being sold from Australia at around 900 US$ (and those two were sold pretty quick). Much more affordable might be some vintage pre-owned models - but again it might depend a huge lot on luck and condition - I have seen TwinQuartz models from about 100 US$ to over 1000 US$ (for very rare high-end models) and I have got my 5E31 at a very low price but only as a result of pure luck. Each of the watches discussed here are rather unusual watches, and while the most special part is the accuracy hidden inside, pretty much all of them (including the vintage models) have plenty of other visual clues to the fact that each is a truly High-End Quartz model! 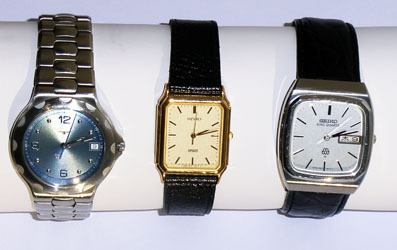 Another very interesting observation might be that all of the watches listed here (including the three 'standard quartz' models) have a very, very good alignment of the seconds-hand - with E510 models being at the very top, but none of the other models is really far behind and as such all start with a rather very good 'first impression'! (it might be a long detour to get in all details on that, but let's just say that the number of impulses for a 1-second step is probably a major reason for that - most quartz calibers have just 2, but Citizen E510 has 10, ETA 252.611 and Seiko 8F I believe around 8 - and generally Japanese manufacturers are clearly more obsessed with such details in their higher-end models so even models that are reasonably-priced can often have a much better alignment than other very, very expensive Swiss quartz models). The common theme in this part of my mini-collection is the INTERNAL HIGH ACCURACY (at an affordable price) - and as such there is no 'common visual style' among those watches - and my desire was to actually have a certain diversity which was well achieved - there are some elegant models, some tool / technical models and some real ISO 6425 divers (but only one HEQ). Given the pretty wide range of age and style of the models discussed, the size is listed here just as a generic initial information on each of the watches rather than a direct 'competition' among them - even if actually to make the information easy to find it will be presented as a table (all values are in millimeters; if two values are listed for a rectangular dial it is width \ height, for crown is real increase in watch width \ actual crown size and for lugs is size at springbar \ size after lugs). I have also listed the size for the non-HEQ models just for easy reference. All the 'rather modern' models are made of very high quality materials, either stainless steel or high-grade titanium. It is not clear if the titanium 8F33 model has a special coating (as on Shinyella or Travelzilla) yet it seems to last very well for a titanium watch (but I was not wearing that one very much and I am very careful with all my watches). Also that very low cost model together with the divers are the only modern watches from the above group that have mineral instead of sapphire crystals - that is however well reflected in the price savings (and is a minor but clear advantage for real diving, when reflections can be pretty bad on sapphire). Also the Exceed pair in steel might have some sort of surface coating - but unfortunately there seems to be no reliable information about that on the Internet. And from the 6 modern models with sapphire crystal only the 3 Exceed models have an anti-reflective coating (on the inside). Somehow surprising (or maybe not entirely so) the old King Quartz from 1979 also has an unusual crystal which might be sapphire - but whatever it is made of it certainly has some anti-reflective coating on the inside - which together with the far more advanced thermocompensation from twin-quartz places such models at least in the same class (or slightly above given the much higher accuracy) as the Rolex Oysterquartz - funny how Swiss models can be so overpriced (or maybe the King Quartz was at an incredibly good price only since most people never even heard about them). All the high-end models from above also have excellent finish with a lot of attention even for small details - a finish which is quite similar to the one found in far, far more expensive models (and even compared with such models you will generally need a 10x magnifier in order to tell the difference). Of course that the age is also playing a role - with the recent models showing the benefits of the technology advancements. Overall I would say that from the models above the highest-end finish and attention to detail is present in the Exceed models, and in the vintage category the King Quartz also deserves a special mention (for instance only that and the two steel Exceed have 'signed' crowns), but none from the above HEQ group is really falling behind and all have a very rich and beautiful look! All the models from this group (including the vintage and non-HEQ models) have high quality hands and dials (every single one has high-quality applied hour markers) and each one has at least one very beautiful and interesting detail which I love! The Exceed models are the only solar watches in the group, and as such have completed an even bigger challenge - the titanium model aims for a very 'shiny look' (hence the nickname Shinyella), but even more interesting is the pair - definitely the first solar watch that I have with a very slightly spherical dial (and a lovely deep color that generates some very interesting reflections and 'irizations' at certain angles)! Travelzilla is quite large, with excellent contrast and a rather technical look (to which the 24-hours markings also contribute), 'the Klingon' also has a nice 'dotted pattern' (which is best seen in strong light), and of course the absolute best contrast and lume is to be found on the Black Ninja - after all real ISO divers are the only watch models where contrast and visibility are major explicit requirements of a standard! The 'creamy' dial on the SBQL001 is also very spectacular and with certain lovely reflections and a very tiny 'pie-pan effect', the Conquest has a very unusual color with a concentric pattern which generates an iridescent look and also the longest-reaching seconds-hand that I have ever seen in a watch (and all the hands and markers are also very shiny and 'rich'), the tiny 5E31 Spirit has one of those classic-Seiko 'paper-pattern dial' (with probably a very-very tiny amount of gold in it) and the King Quartz also has a certain longitudinal-bands barely-visible pattern and excellent contrast on the main hands! Two of the Seiko models in the HEQ group also show another lovely but very practical Seiko refinement - shiny hands with an incredibly thin 'blackened longitudinal groove' which dramatically increases the visibility of the hands at all angles - one in silver (SBQL001 'Creamy Beauty') and one in gold ('Tiny' 5E31); same refinement is present on the hour markers on those two models but also on some other - for instance the King Quartz, and the Exceed models also have a similar kind of multi-faceted very shiny hour markers which result in a very 'luxurious' look and excellent contrast. The Exceed models also have another fine touch which is normally only found in ultra-expensive watches - the seconds-hand for each of those three are not drilled at their insertion point and instead show a very nice perfectly flat and shiny surface! All the watches in this group have a very good visibility and all have good or very good contrast in normal light - the best among the 'dark dial' models are the 'Black Ninja' and "Travelzilla' and from the 'light dial' (and more elegant) models - the 'Creamy Beauty' and 'Old King'. The story is a little different at night - not all of the 10 HEQ models have luminous paint on dial and/or hands, the Exceed pair only has an 'elegant' amount on hour and minutes hands, also the 'Conquest' and 'The Klingon' have a small amount of lume (including small dots for the hour markers), however the only two models that are really usable at night are again the 'Black Ninja' and "Travelzilla'. I am myself more 'aesthetically attracted' to models with more discrete writing but the hard truth is that all the high-end quartz models are great technical and engineering achievements only made possible by a certain degree of mass-production which would become useless if the consumers would never learn about that - so a little pride based on objective performance is a necessary thing - and all the modern HEQ models above are clearly proud of being a perpetual calendar - with one extra mention about the precision on the Longines (VHP, but again this one is part of a long legacy) and a separate mention for the solar models (which makes sense given that is a huge sales point among normal customers). A separate mention has to be made about the 'SCUBA 200m' from the Black Ninja (and the 'DIVERS 200m' from the non-HEQ Yellow Kinetzilla) - very few people know that there are now international standards regulating aspects related to generic water-resistance in watches (ISO 2281) and to actual diver watches (ISO 6425) - and just as is prohibited to use the gold, silver or platinum markings on objects that do not fit that marking, it is now prohibited to use the words DIVERS or SCUBA on watches that have not INDIVIDUALLY passed the very specific requirements of ISO 6425 - and as such having such markings is another major achievement on a real diver watch (and you might see plenty of watches with bigger depths written on them, but which mean close to nothing in the absence of the rigorous testing level required by the standard). There is absolutely no direct relation in the internal architecture between the Seiko and ETA calibers yet those have a slightly similar mechanical design which is derived from the common design of all analog quartz models - in which you have a main one-way stepper motor which moves the seconds hand which in turn is physically geared (with 60:1 ratio) to the minutes hand which in turn is again physically geared (with a 12:1 ratio this time) to the hour hand - that is how the vast majority of the analog (hands) quartz calibers in the world work and also how all watches from above work - with the exception of the three Exceed models and also with the differences related to date corrections on a perpetual calendar - unlike 'normal date' models where the hours-hand is geared in either a simpler 'slow change' or more complex 'instantaneous change' way (and might or might not have a quick-set complication), in a quartz perpetual calendar you need a way to automatically advance the date in a special way for instance when changing to March 1st - that requires extra 'motion generators' - in the form of extra steppers or in the case of 8F calibers the 'ultrasonic motor' - that one is reasonably easy to make bi-directional while for instance the ETA caliber is using a rather unusual design for the extra stepper for the date with a single rotor but two smaller coils! There are also some more obvious and other less obvious differences, of which by far the most interesting for a HEQ watch (or any travel watch) is the independently-correctable hour-hand - that is a pretty rare but very nice feature, based on which the hour can be corrected without the need to also reset the minutes/seconds which 'keep ticking' at the normal rate during this correction - a very handy thing when traveling over timezones or on Daylight Saving Time changes! All the Exceed models have that feature, and also one Seiko and the Longines - but both the Seiko 8F56 and the Longines L.546.2 have a 'primarily mechanical' correction mode with a small extra sensor for either 24 hours (in 8F56) or for 12 hours plus some 'software' (in ETA 252.611) - that extra sensor is needed for those 'primarily mechanical' calibers in order to 'know' when the date change is needed and also to see the direction of it - all the five watches with that smart timezone correction will also know to change the date forward or even backward when you do a correction that needs that! However since it is a 'primarily mechanical' correction based on a separate sensor you can have one small inconvenience - the date change might not take place precisely at midnight at 00minutes:00seconds - and that is the case with both the Seiko 8F56 and the Longines VHP Perpetual (and also with the Seiko 8F33 and 8F35 calibers). Moving now to the Exceed models we probably see some of the most advanced design styles of the all-analog quartz mechanisms - a "fly by wire" design in which the crown is not directly linked mechanically to the hands but instead it drives a sensor (which clicks for user feedback) which in turn sends impulses to the internal circuit which in the E510 then drives two full two-way steppers - one for the minutes hand which is also geared to the hour hand and the second stepper for the date - plus one single-way special stepper for the seconds-hand. The hands even have a way to be user-recalibrated (with the all-reset procedure) and one extra recessed pusher allows for more commands - of which the simplest is the 1-hour correction (on the normal crown position). The date advances precisely at 00:00 (and it only takes like 1-2 seconds for each advance), and it will correctly advance or go back even during time zone changes. A very smart design also makes E510 the analog design with the longest battery life between recharges - the seconds hand (but only that, everything else works normal) will stop ticking in darkness (when you can not see it anyway) and only that reduction apparently can cut the power to a level where it can last about 4 years with a full battery charge! (compared to 6 months for calibers without that optimization). The really fun part of this however is when you bring the caliber E510 back to light (for instance in a gray day when the watch was hidden under your sleeve and then you want to check the hour or when you turn on the lights in a very dark room) - at that point the seconds-hand will restart and quickly-quickly go to the actual seconds value! And of course being a solar watch you never have to worry about battery changes or wearing the watch each day to keep it working - you just need to leave it somewhere in light (but not direct sunlight which might heat the watch too much). The rechargeable Panasonic MT920 also seems to be very well regarded and it will probably last a long time, and it is anyway available at a decent price (since pretty much over 90% of the rechargeable batteries used by watches today are either MT920 or CTL1616). (extra clarification on E510 - when the seconds hand stops in the dark you are at the first level of power-save, then after about 3 days of continuous darkness caliber E510 will advance to second power-save level, where the minutes/hours hands also stop; I am still investigating but it seems that on level 2 some accuracy problems might be sometimes encountered). An even more spectacular achievement is the E410 caliber - having a normal-size perpetual calendar is interesting but 'doable' once you have three independent steppers, but having the same in a very small solar caliber (barely bigger than just the rechargeable from the E510 caliber and in the same range on total diameter as just the battery of the Seiko 8F and ETA calibers) would certainly be a huge challenge - which as far as I know only two companies in the world have mastered with High-End-Quartz perpetual calendar ladies models - Citizen and Seiko! So extra ingenuity was needed for the E410 tiny design, and the clever trick there was to only use two steppers (both two-way) instead of the three steppers in the bigger E510 - but the caliber still needs to do with just two steppers all the functions that would normally be done with three - and the only way to do that is to gear those in a slightly different way and combine that with a smarter integrated circuit! So instead of having the seconds hand alone on an independent stepper and not geared to anything else, you now have that one geared together with the minutes hand and together driven by one stepper, and the hour hand geared together with a high-quality two-way date indicator together driven by the second stepper! That of course needs extra cleverness on certain actions - it is obviously simpler/faster when you do timezone corrections - on the E510 the minutes hand does a full rotation to move the hour hand one hour forward or backward, while on E410 the hours hand just moves directly and quicker (I believe it makes one step for 6 minutes or 72 steps for a full rotation), however two other scenarios are more complex on the E410 than on the E510 - the power-saving mode will also stop in the E410 the minutes hand but when restored will also need to move that to the final desired position, so it only makes sense to enter power-save after more than 1-2 hours of darkness (instead of 1 minute on E510) and when light is restored you can see the seconds hand moving very fast for quite a number of full rotations forward or backward (up to about 30 quick rotations) in order to get the minutes hand in the correct position; and of course the date advance is also slightly different - it is no longer instantaneous as in the E510 (it takes about 2 hours to go either way), and when E410 needs to advance the date more than once (as on March 1st) it will have to do a full 24 hours rotation forward with the hours hand - not as quick as with the E510 where the date has a special dedicated stepper only for that single purpose, but still reasonably quick even on non-leap years and a brilliant way to still implement complex things in such a small caliber! Finally we can now move to timekeeping accuracy - the feature that really differentiates those calibers from 99.99% of the other quartz calibers and what still is the most valuable objective indication of actual performance in a High End Quartz! But before getting into the actual results of those specific watches it might be worth mentioning a few words about why ultra-accurate timekeeping still is a certain technological achievement which not many watches (and companies) can claim - and it all starts with quartz properties and the fact that the piezoelectric effect in it does not automatically have a fixed natural resonance frequency, but instead that is very specific linked to the actual dimensions and precise shape of the crystal - what it is called the 'quartz cut'. To cut the story short (pun intended) there are many such quartz cuts, but for low frequencies (like those used in wristwatches - which are severely constrained by limits in power consumption) the most practical one is the 'tuning-fork' one - a very-very small 'tuning-fork' which resonates around 32768 times per second. Unfortunately the precise frequency of such a shape can also depend a little with the temperature - the difference might seem small at 5-10 parts-per-million but that is actually representing a range of 20-30 seconds/month - which can at best be centered as an error interval of around -15 to +15 seconds/month (or +/- 180 seconds/year). To achieve even that precise centering is no small thing (and you will still see plenty of quartz models only guaranteed +/- 20 or even 30 seconds/month), but in order to raise the level from there to something in the range of 20 seconds/year you need to do more than that! The alternatives are grouped on two directions - either to use different (and more special) quartz cuts with a different (higher) frequencies or to use some thermocompensation (TC) method on the normal 32 kHz quartz - the first method was most notably used in the middle of the '70s by Omega Megaquartz and Citizen Crystron Mega and today is only used in wristwatches by Seiko 8F calibers and very recently by the new Bulova Precisionist family (Bulova being now part of Citizen), while the second method was used by a larger group of watches in different forms from very-very simple ones (like having a simple capacitor with a temperature curve somehow opposed to the one from the quartz) to some very complex methods involving specific digital counting with the inhibition (=skipping) of a variable number of ticks from the quartz crystal. In this small and rather inexpensive group of HEQ models the oldest (probably before 1978) TC method is the one present in the King Quartz caliber 9923 - the method is based on having two quartz crystals both around 32 kHz and using the difference from them as a way to indirectly measure temperature - and from that the number of quartz ticks that need to be skipped in order to achieve a better accuracy - a more detailed description of the method (including some screen-shots of the service manuals) can be seen in this post from the HEQ forum at WUS. Probably the next oldest TC method from this group is the one used in the three Exceed models, and which is almost certainly related to the method described for this 1981 Exceed model using the 2730 caliber - a (very rough) description of the method can be found in the service manual for the 27xx family of Citizen calibers and more on the subject can be found in the thread here with a reference to this post and a conclusion in this post - generally the method is using a single quartz crystal kept in an oscillating circuit which can be 'commuted' between two modes / frequencies - and by (variably) altering (based on the output from some thermal sensor) the 'fill factor' between those two frequencies a final thermo-compensated frequency is achieved (somewhere in-between those two - I call that method '2-frequency-variable-fill-factor') - the method has certainly evolved since those very early 27xx calibers - that manual suggest an interval around 2 seconds, but almost certainly the modern Citizen calibers derived from that one (E510/E410, 0330, A660) use a cycle around 10 seconds - which also 'fits' very well with the 'raw digital inhibition' period of 10 seconds that did replace the trimmer condenser in all modern quartz calibers. A third method is the one used by the Longines (ETA 252.611), and which with (smaller or larger) variations is probably related to the first Longines thermo-compensated caliber - L276 from around 1984 (in a Conquest VHP, what else :) ). In that first version the method was probably very similar to the one used in Seiko TwinQuartz models, with two quartz crystals (this time one around 32 kHz and a second around 256 kHz) and using the difference between them as a way to measure the temperature and adjust the final frequency based on that, but already around 1985 (when ETA seems to have adopted the method) the second quartz was replaced in some calibers with a thermistor with the result of the (still current) ETA method. A very detailed description of the method can be found in this excellent thread (again from HEQ forum at WUS) - suffice to say that the method is using a primary/raw inhibition period of around 480 seconds (which only corrects the raw error of the quartz, just the same as the 10 second raw inhibition period used in more ordinary quartz, but this time with much finer accuracy but also in much higher corrections - almost 20 milliseconds in some models) and a secondary thermal-only correction at around 240 seconds intervals (or 2 corrections in the same 480 seconds interval) which this time is (probably) only adding (to some internal counter) a correction for the temperature. And of course the 'best represented in the group' method is the one used by Seiko 8F (and 4F) calibers - a medium-frequency quartz (around 192 kHz) which has a somehow 'flatter' dependency with temperature and on which that variation is very precisely 'centered' (by basic digital rate correction) in order to have the errors from a lower temperature (like room temperature) being mostly compensated by the opposite-sign errors from higher temperatures (like when wearing the watch). Nothing is 100% clear on the Seiko 5E31 caliber - it seems to be using a 32 kHz quartz, so most likely some form of thermo-compensation is used internally. - the Old King Quartz was left as the very last since it has the ultra-rare feature that you can adjust both the average rate AND also the thermocompensation curve - again the details are in this post - it is far from easy since the adjustment is done with two analog trimmers and both are very, very sensitive, but IMHO it is a huge achievement to still be able to adjust this watch well into HEQ territory (and well above any Oysterquartz) even after 30+ years!!! Very high stand-alone accuracy within the size and power limitation of a wristwatch is certainly not a very easy task - that was true ever since the first quartz watch revolutionized modern timekeeping and that is still true even now in the 21st century. But today it is no longer so hard (and certainly easier after the first time) to achieve such special milestones when you have a huge amount of resources dedicated to a single problem - so today the actual high-end engineering challenge is to reach such milestones at a very convenient price point and to keep doing that on the long term in a way which actually solves real and measurable goals! During the last years there might have been models which are (just slightly) more accurate, but all those models have only been at vastly higher prices (or have become unavailable as a result of specific marketing decisions), so with that metric in mind the affordable models from above are among the most interesting technical achievements of the last decades - and unfortunately have been valued by the general public with the right attention only when it was too late and as such those models are now becoming pretty much extinct - which is probably only fitting for a world which increasingly values cheap marketing more than actual real performance - and in such a world wearing a real technical wonder on your wrist will just be like a badge of honor among countless faces wearing (equally machine-made) pedestrian automatic or mechanical models which don't even have the accuracy achieved by Harrison's H4 centuries ago, and which have been just been the result of mindless and endless marketing.